So, you’re going to Napa Valley. Yay you! But where to rest your wine-woozy head after a full day of vineyard-hopping? 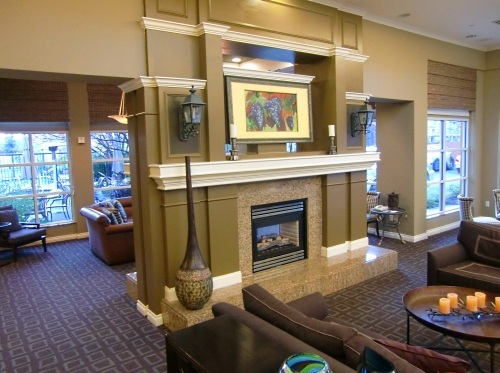 Here are seven reasons to choose Hilton Garden Inn Napa for your Wine Country getaway. 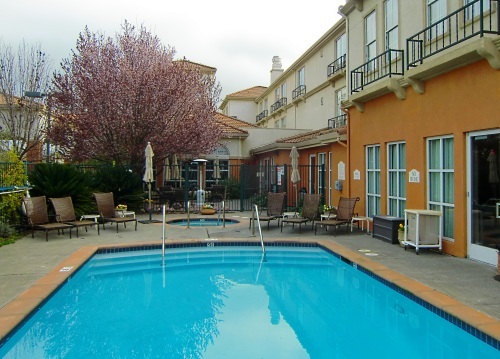 What would be the first thing you would do after checking in to the Hilton Garden Inn Napa? Let us know in the comments! 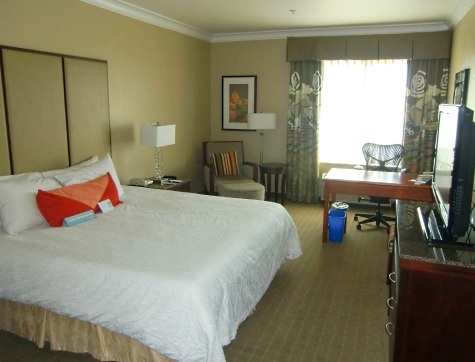 The uber-friendly staff is what I love most about Hilton Garden Inn. 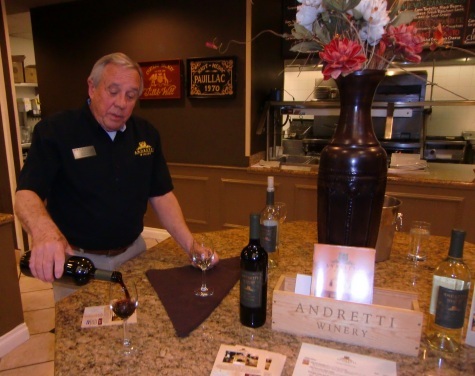 Similar to staying at a B&B, the employees are always happy to provide recommendations and directions for local restaurants, wineries, and attractions. Some hotel lobbies are showy and luxurious but not welcoming, and you rarely see hotel guests making use of them. At Hilton Garden Inn Napa (and, really, at any Hilton Garden Inn where I have stayed the night), people actually hang out in the lobby. They read the newspaper over a cup of coffee, gab over a glass of wine (purchased at the on-site Pavilion Pantry or off-site), or in chillier months, warm up by the fireplace. If you’re staying with kids, choose from an array of board games (like Monopoly, Apples to Apples, Yahtzee, Jenga and more) to play in the lobby or in your room. Hilton Garden Inn Napa offers a bunch of little extras that go a long way to make you feel welcomed. 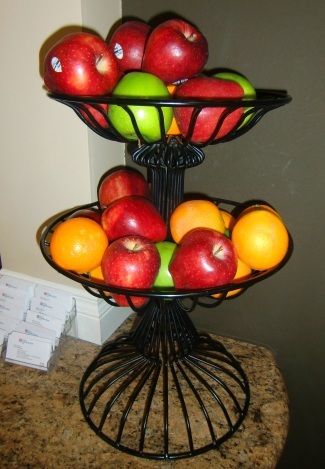 Pick up a piece of complimentary fresh fruit or a cup of free self-serve hot coffee or tea at the front desk. Right next door is the Pavilion Pantry where you can purchase a bottle of wine, sodas, newspaper, chips and other snackies, as well as forgotten healthcare items like toothpaste and such. The hotel is decorated with Wine Country touches, with artwork featuring hot air balloons and rolling hills of vineyards, which add a an extra layer of coziness to everything. More importantly, every Friday and Saturday evening, guests gather in the lobby for a complimentary wine tasting hosted by local vintners eager to show off their drinkables. With so much delicious food and drink available in Napa Valley, it’s nice to know that Hilton Garden Inn has some options for those seeking to work off extra vacation calories. Swim some laps in the outdoor pool, work out in the on-site fitness center, or request a Stay Fit Kit free from the front desk, complete with Pilates band, yoga mat, ab ball, and weights. There are even free on-demand exercise videos available on in-room TVs. If that sounds like too much work, the pool is a wonderful spot for splashy family fun and the whirlpool spa is available for some hot, bubbly relaxation. Hilton Garden Inn hotel rooms are outfitted with flat screen TVs, mini refrigerators, coffee makers, and Neutrogena beauty goodies. I appreciated the presence of a recycling bin, something that is sorely missing from many hotels. All Hilton Garden Inns feature Garden Sleep Systems beds that can be adjusted on either side to suit the firmness factor for two sleep-mates. Add free WiFi to the mix and you should be one happy Travel Mama (or Travel Daddy)! 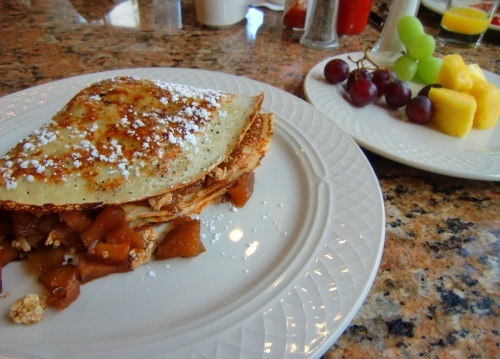 Breakfast is the most important meal of the day, especially when it’s a delicious cinnamon apple and granola crepe! Other options at the hotel’s Great American Grill include made-to-order omelets, breakfast potatoes, yogurts, juices, cereals, and tasty pastries. Finally, if you still need another reason to book a room at Hilton Garden Inn Napa? Fine, I’ve got one. Price. Rooms range from $139.00 – $299.00, depending on the season. In swanky Napa, this is quite a bargain. ‘Nuff said. A Note from the Travel Mama: Thank you to Hilton Garden Inn for inviting me and my sister to Napa! The first thing I would do?! Jump on the bed! Then take a nap because there is NOTHING better than sleeping in a hotel bed away from home. Plus – NAPA! Ooh…that sounds lovely Maribel. Happy 11th anniversary (in June)! It would have to be exercise. It would be the weekend reception where I could sample the local wines. We’ve been looking for a great family getaway for the summer and I think this would be perfect! We might need to bring the MIL to stay at the pool w/ the kids as we explore the vineyards. We’re actually pretty loyal to the Hilton Brand and I love the extra touches of this hotel. You also got me at complimentary wine tasting. =) Yum on that apple crepe. It sounds like a great trip for you and your sister. first thing? sit down with a glass of wine. then have another. then another. it’s Napa afterall. Hubby actually wants to go back so i should start planning. I’d love to go to Napa sometime. First thing I will do is to see the scenery out my window. I would find a cute little outdoor place to snack on cheese paired with a Napa wine!! Oh wait! That’s what we DID do first. Perfect weekend in the perfect place with the perfect sister!